One of my favorite places to find decorating treasures is the Dollar Tree. I love it because you never know what you will find there, and whatever you do find is only $1. So whenever I'm pondering new decorative accents, the Dollar Tree is one of the first places I go hunting. Most recently, I wanted some type of board to pin up notes and recipes in my kitchen. So I decided it was time to make a Dollar Tree trip. 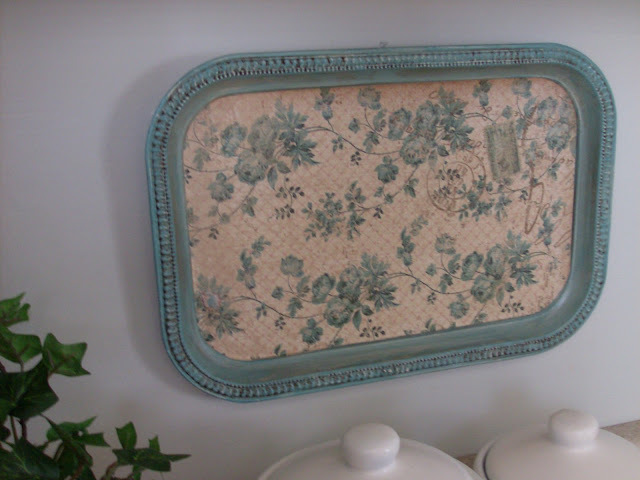 This metal tray was the solution, I could customize it to match my kitchen colors and it fit into the space under my cabinets. First, I primed the tray. Next, I painted the edges with Art Deco's Dark Eucalyptus Green paint after lightening it some with white paint (since they no longer carry the Light Eucalyptus Green color). Then, I antiqued the edges with FolkArt Antiquing Medium. 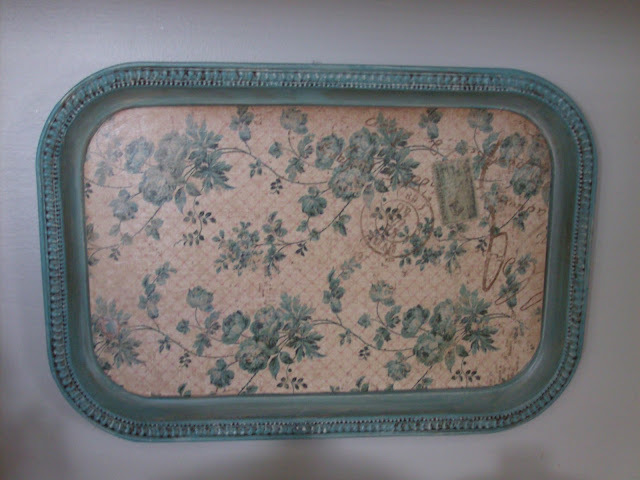 I had some scrap booking paper with a beautiful turquoise floral design that I loved and thought it would be perfect for my tray. 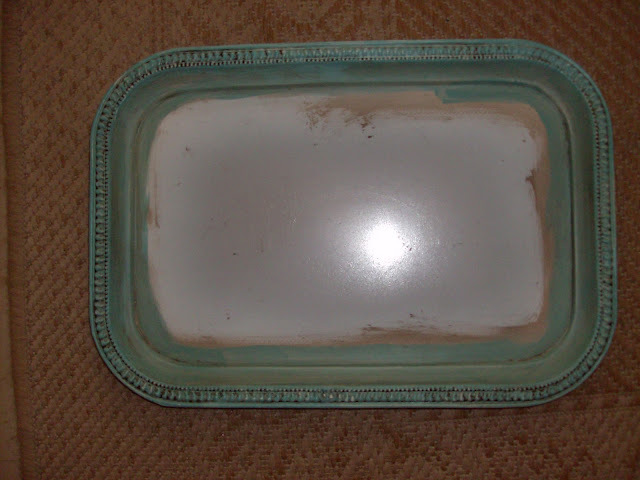 I measured and cut the scrap book paper to size and then applied a layer of Mod Podge Matte-Mat to the tray and affixed the paper to the tray. I then applied two more coats of Mod Podge over the paper to seal and protect the surface. Finally, I glued a sawtooth hanger onto the back for hanging. Now I have a decorative wall hanging and magnetic board. This was a very simple, easy and inexpensive project that is not only functional, but also also adds a huge pop of color to my kitchen. I love it! Great Idea! I'm a fan of the dollar store myself, but I'd never guess that where this started. Love this! 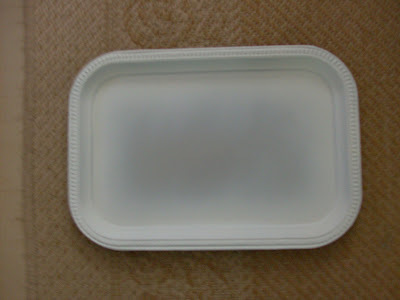 I have a tray that I was trying to find a use for. Very cute. This is incredible! I thought it was an expensive vintage piece when I saw the first picture before reading how you did it. It looks great. 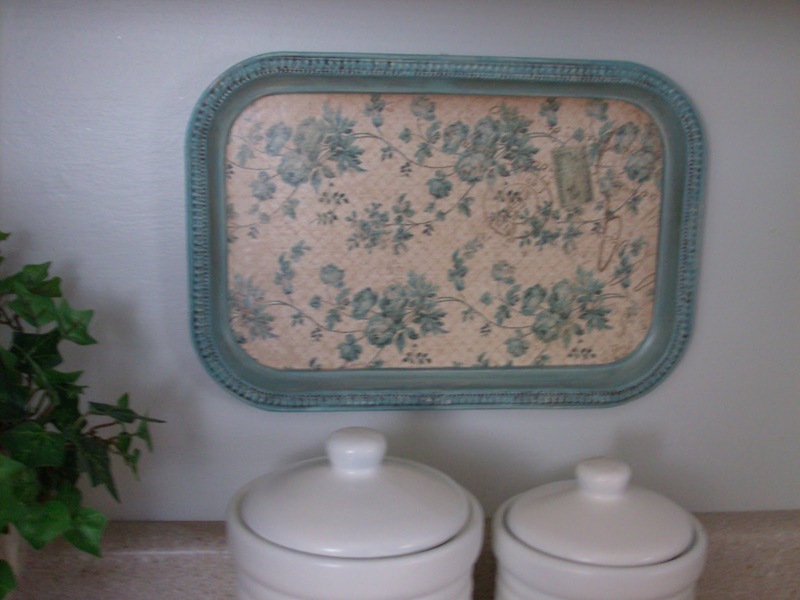 I have some bare walls in the kitchen that I could use something like this on, I am going to check my Dollar Store for a similar tray, thanks for sharing! I adore your tray! The color matches the paper so perfectly! This is a beautiful project! I love the $ store too. I always find something and I never pay too much! I may just have to go out and do this! Thanks,this is one of my favorite projects and it was quick and inexpensive, under $2.